One of the most respected designer brands that has been in the creative industry for many years has ventured to London’s greatest Fashion and Textiles Museum to give you an insight into the creative processes of their italian fashion house. 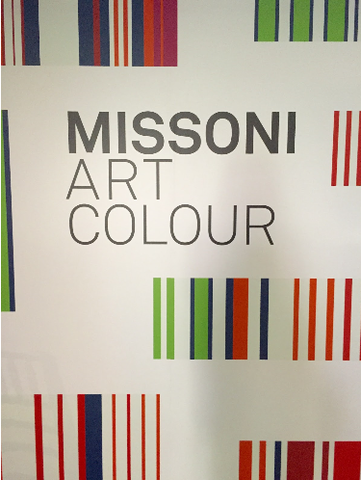 Ottavio and Rosita Missoni, the founders of Missoni, have developed their brand into various avenues across design world and we went to check out what Fashion, Interior and Art work the exhibition had to offer. The exhibition begins with a traditional art gallery layout where you see many inspiration paintings from abstract artists like Sonia Delaunay and Bella and Gino Severini. It is clear to see the similarities in all the paintings displayed highlighting what elements the couple liked and wanted to develop into their own designs. Ottavio Missoni chose to create many wall hangings made with knitted patchwork. Many of these are displayed around the exhibition so it is possible to see them both close up and from a distance. Although many colours are used throughout all of the wall hangings it is clear to see that all combinations have been carefully considered. By creating wall hangings with no real structure other than the original construction allowed Ottavio to have a unique way of merging his interest of art and fashion. These wall hangings were the basis and textile research for when he developed his work in a new form to produce fashion collections. Missoni is well known for its fashion collections but also a lot of its woven materials have been used in the interior industry. A room is dedicated to many mirrors and carpets all using the Missoni patterns. An exclusive documentary is played in this room which gives you more of an insight to the makings of all avenues of the Missoni brand from the perspective of the Missoni family themselves. If you would like to visit this exhibition it is on from 6 May – 4 September 2016.